It is important to note that for his part, Calipari has denied (again) that he's looking to leave Kentucky or that he's been negotiating with anybody. Of course, the door is not completely shut quite yet and considering that Nets owner Mikhail Prokhorov has not backed off his short-term dreams of a championship, nobody really knows what could be in store. But would it really make sense for the Nets to devote an immense amount of coin to turn their organization over to a coach that has failed once in the NBA, and for said team no less? Calipari did lead the Nets to a playoff berth in 1998, their first postseason appearance in four years, but he also rubbed his fair share the wrong way and was ousted midway during the strike-shortened 1998-1999 campaign. 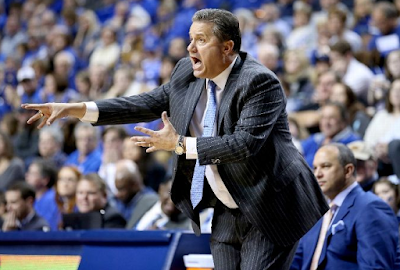 It is very well possible that an older and wiser Calipari who has long secured his basketball legacy by wildly successful turns at Memphis and Kentucky can prosper in his next go-around in the league, although that famously didn't happen for Calipari's nemesis, Rick Pitino, with the Celtics in the late 1990's. The lure of Calipari for the Nets would seem to me to be a way they can short-circuit a sorely-needed rebuilding process with the hopes that his big name would be able to bring stars to Brooklyn. But guys like DeMarcus Cousins and John Wall would be a couple of years away and there's no guarantee that even a guy like Calipari would be able to bring those guys into a situation like this. It's not like Phil Jackson had a ton of success luring the big-time guys to the Knicks this past offseason. I understand that the process is going to be very difficult considering that Brooklyn has one first-round draft pick in the next three drafts, but there simply isn't going to be a simple, quick-fix for Prokhorov and the organization to pull off to become a playoff team. They tried the strategy to make big trades for expensive veterans and it got them to one conference semifinals and two other one-and-dones, while leaving the future of the team in shambles. Ultimately, the Nets need some sort of a plan if they want to be relevant and simply throwing more money at the problem, this time by luring a high-profile college coach, is not going to fix it.